Camel trekking through the Sahara desert is not an opportunity you get every day! When I headed out to Morocco to take on the Atlas Mountains challenge in June this year, visiting the Sahara was one of the things I was most looking forward to. I think, for most people, it’s the pull of getting to see such an iconic place combined with the exciting prospect of camel riding which convinces them to sign up for the extension. But one of the things that really struck me about this trip was how much more there is to it than that. We began in Marrakesh and spent a day exploring the city’s ancient souks (or markets to you and me). Anyone who’s been to Marrakesh before will tell you how hectic it is, but even with all the warnings we were definitely not prepared for the madness! The narrow market streets are crammed with tourists and locals alike, and you will be bombarded by market sellers pushing you to buy everything from colourful cushions to rather questionable looking meat. It’s definitely an experience worth trying - and if you’re not so keen on pushy selling tactics, try exploring the markets in smaller groups of two or three to avoid drawing attention to yourself. Having spent most of my money on completely unnecessary patterned bowls, silver earrings and so much Ras el Hanout I could eat Moroccan food exclusively for a year, we rewarded ourselves with a meal at Cafe Arabe (highly recommended if you’re looking for a not-too-pricey evening meal with a sophisticated feel). We then spent the night in a cosy Riad-style hotel in central Marrakesh, a short walk from the main square and a perfect base for exploring. The following morning, we boarded the bus and began our two day journey to the Sahara. Our guides were keen to pack in as many sights as possible along the way and teach us all about their history. A personal highlight was seeing the Ksar of Ait Ben Haddou. 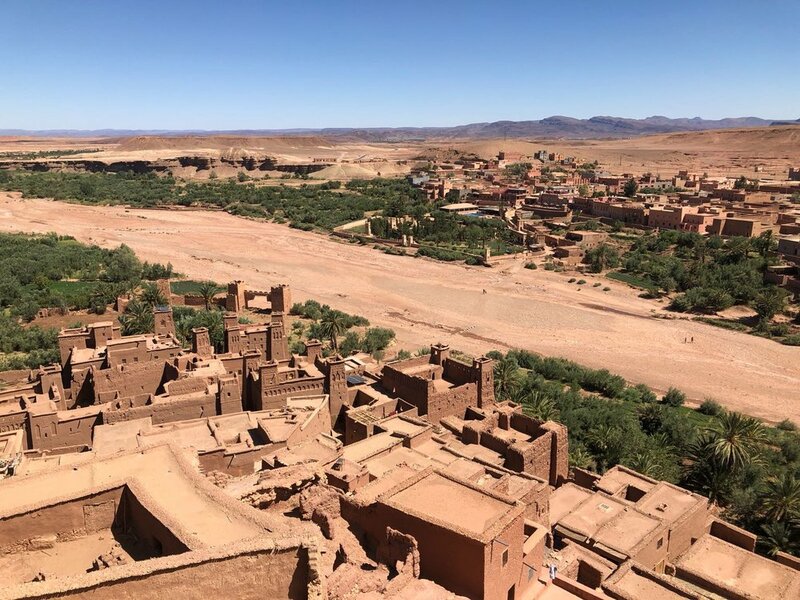 Our guide explained that ksar is the Arabic word for fortress, and that the surrounding Ounila valley was filled with them, Ait Ben Haddou being the most famous and a UNESCO World Heritage Site. Although the traditional use of the Ksars were as protection from invaders, they have now become commonly used as film sets. Inside the walls of Ait Ben Haddou there is a mural which proudly displays a long list of films and TV shows which have been filmed there, including Game of Thrones, Prince of Persia, and Gladiators. We then continued on our journey towards the desert, spending the night at a beautiful hotel set into the side of the mountains, before arriving at the Edge of the Sahara the following evening. Upon arrival we were introduced to our camels. I’m a bit of an animal lover and instantly fell in love with mine (although I’m pretty sure he did not feel the same way about me). Getting on to a camel is a pretty tricky business and we all had a good laugh watching each other’s faces of panic as, one by one, our camels stood up and almost threw us off their backs in the process. Once we were all safely onboard, our camels took us the two hour journey across the dunes to our accommodation for the night out in the desert. We stayed in a camp in traditional Bedouin tents, decorated with bright and colourful Moroccan furnishings - they were quite a change from the tents we’d become used to on the trek! Although the tents were beautiful and very cosy, the almost 40 degree heat meant that it was difficult to stay inside them comfortably for long when we arrived, so we decided to sit outside and the enjoy the views until the sun went down. And what a great decision that was - having lived in a London suburb pretty much my whole life, I can’t really remember ever seeing complete and utter darkness before. Once night fell, all you could see around you in every direction was darkness, and in the sky the stars looked clearer than I had ever seen them. The following morning, the whole team woke up at the crack of dawn and sat together along the top of a dune to watch the sun rise; what a perfect way to end our time in Morocco.